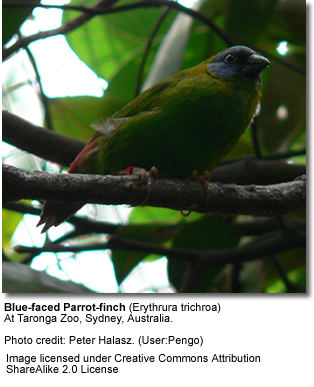 Blue-faced Parrotfinches (Erythrura trichroa) are found in north-eastern Australia, Japan, Indonesia, Federated States of Micronesia, New Caledonia, Palau, Papua New Guinea, Solomon Islands and Vanuatu. They have also been introduced into France. This species is locally common and has an estimated global extent of occurrence of 10,000,000 km². They are usually seen along the edges of forests and grassland areas. They tend to be shy and are usually seen alone, pairs or small groups in subtropical/ tropical in both montane and lowland moist forest areas, where it is most often associated with forest edges and disturbed habitat. Size: They average 11 cm in length. 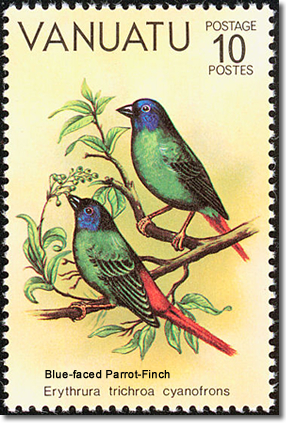 Male Royal Parrotfinches have a blue head and red upper tail coverts. The plumage is otherwise mostly a bright forest green. 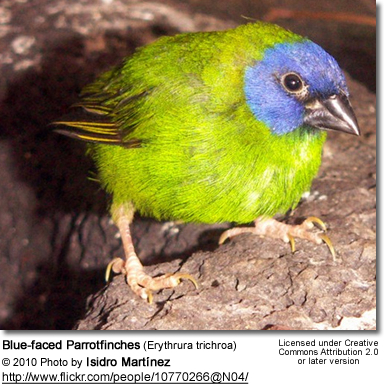 Immature Blue-faced Parrotfinches are duller and have a dull blue head. They attain their full color at 20 months. They typically feedy on seeds of grasses, including in Australia several exotic genera especially Brachiaria. Within their natural range, most breeding starts in September with the building of a big nest of grasseshigh in the trees. In captivity, the breeding season will be dictated by the climate and length of the days.